When it comes to cutting back on salt, many people think, healthy, to be sure, but good-bye, flavor! 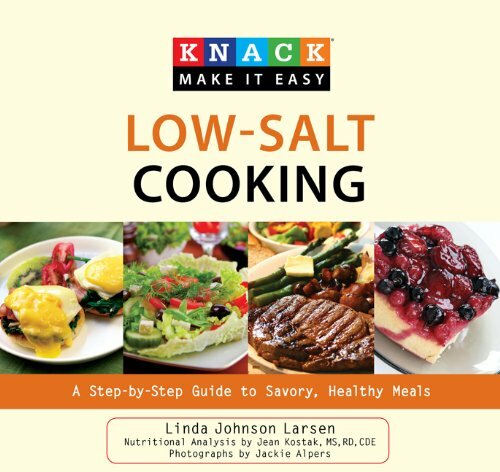 Enter Knack Low-Salt Cooking, whose step-by-step, visual format makes healthful—and delicious—food accessible to everyone. It shows how we can add luster to our foods again by using such ingredients as herbs, spices, and lemon juice. Featuring 100 main recipes plus 250 variations, and 350 full-color photos, it gives an exotic new twist to familiar foods. All recipes are accompanied by a nutritional analysis—including sodium amounts—by fully licensed and accredited nutritionist Jean Kostak.